Showcase your accomplishments, while preserving them for years. Clear acrylic faceplate easily lifts to change documents. Includes blank Certificate of Award and four decorative tacks. Frame conveniently hangs vertically or horizontally. Showcase your accomplishments, while preserving them for years to come. 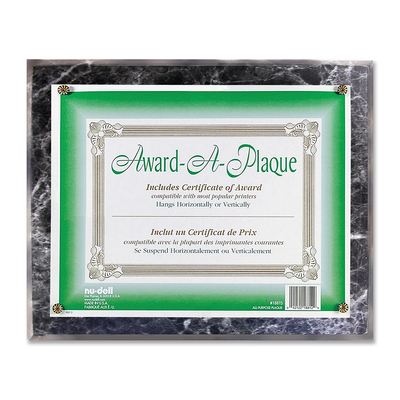 The clear acrylic faceplate on Award-A-Plaque easily lifts to change documents. It includes a blank Certificate of Award and four decorative tacks. The frame conveniently hangs vertically or horizontally.